I posted this in another part of the forum, but didn't realize there was a Colecovision section. I have a fried resistor and diode and was wondering if someone knows which they are so I can replace them? I am attaching pictures as well. Thanks for your help! Luckily my Exp Mod #1 is still in pieces so I have my board available to check. The diode (ZD2) on my board is a Motorola Zener Diode type IN5222B. Closest I can find to an original datasheet for this part starts on page 431 of this pdf. Ikrananka, thank you so much! Edited by Izen, Mon Mar 18, 2019 11:02 AM. You're welcome Let us know how the repair goes. Will do. Just want to know, does the amount of watts for the resistor matter? What would the best wattage for it be? Thanks! Edited by Izen, Mon Mar 18, 2019 11:38 AM. Those look like quarter-watt resistors. Thanks Ikrananka for the full part number. That's a 2.5V zener. All the "22B" zeners I found previously were over 20V, which didn't make much sense. It might be a good idea to replace both zeners though, even if just the lower one is deformed. Also, seeing the whole board, it's apparent that these diodes are supposed to act as a voltage regulator. Edited by ChildOfCv, Mon Mar 18, 2019 11:56 AM. Thank you! I'll purchase the 1/4 watt resistors and a couple of the diodes today. Thanks so much for your help. I'll post how this repair goes once I receive everything. Hoping to bring this back to life! What's interesting, looking at mine, is that the two diodes on my board look different, although they appear to be the same part. One is rounded and curved. Has this been heat affected? Perhaps I need to replace mine as well? It may just be a different manufacturer. Or maybe Motorola changed their package look in the middle of Coleco's mass purchase. They definitely don't look deformed or heat-tarnished or anything. Thanks. The module works so I guess really no need for me to meddle with it at the moment. From everything I've heard, exp module 1 is basically a 2600 sans power supply and RF. 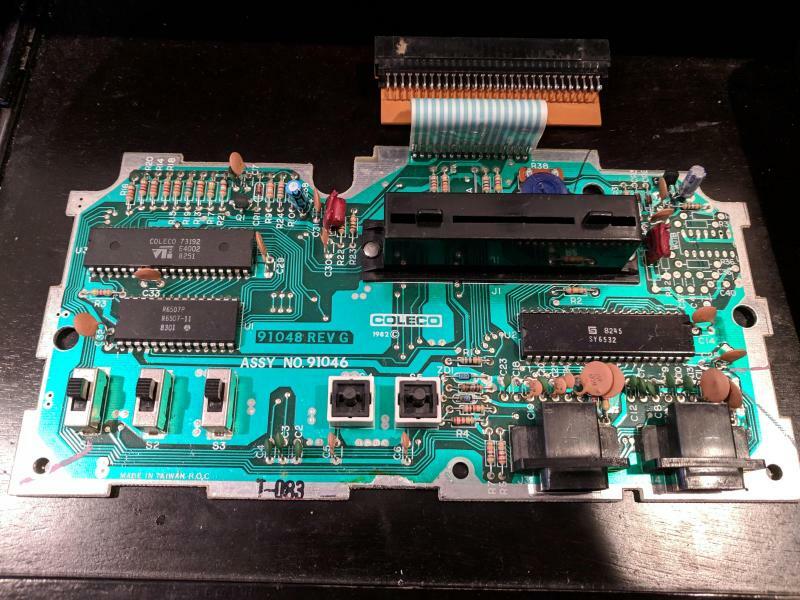 Knowing Coleco also did the Gemini, I found a picture someone posted here on AA of the PCB. 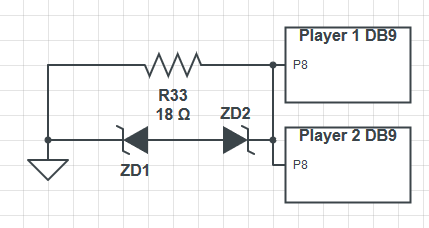 Logic being the EM1 and Gemini would be similar circuits (why reinvent the wheel, right?). I don't see a single diode on the Gemini. Which would imply Coleco purposely used the due to interfacing with the CV. It seems odd they used them on EM1, but not their stand alone clone. I actually have my EM1 out right now. If I get bored this weekend I'll open it up and see if I can at least see where the diodes connect to with my DMM. From everything I've heard, exp module 1 is basically a 2600 sans power supply and RF. From what I read somewhere, I believe the Exp Mod #1 is also without a clock and instead uses the clock in the CV via the expansion port. It has a 15-contact ribbon, so yeah it probably uses more than just power, ground, external video, external sound, and external video enable. Well, it probably also holds BUSRQ and/or WAIT in order to keep the ColecoVision CPU from going who knows where, also. After all, what I've named is only 7 pins worth. Just had to say that you guys are awesome. I'm curious to hear what you find. I'm still waiting on my diodes and resistors to come, but I will definitely say what happens to my system when they are replaced. I sketched out this part of the circuit. Well, I traced it out. No guarantees of accuracy yet, but here is my first pass. 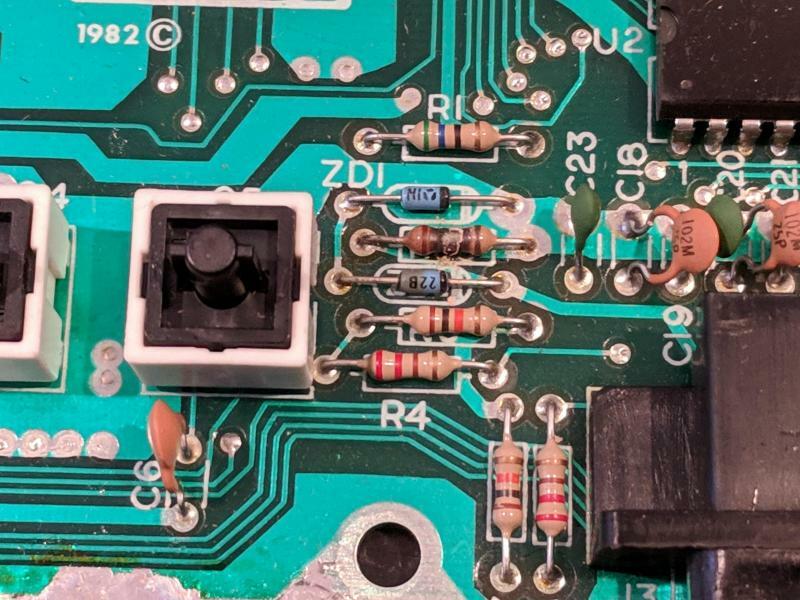 The zeners give the port a -2.5V boost on ground, and I have no clue why they'd want to. It's also a rather weird lattice they created. Anyway, it does raise doubts that this is the only thing wrong with the system, as the video part is entirely elsewhere in the circuit. Wow - this is fantastic. I want to do an RGB mod to one of mine and this will help enormously. Will you be doing a second pass? Yeah. Pass 2 will be to place everything on the PCB with as much accuracy as my engineering scale can muster, then run the traces as seen on the board to make sure they all hit the correct pins and components. Just curious how the RGB mod would work. Do you mean to replace the fake TIA (FIA?) with the FPGA remake? If so, you'll need a sandwich board to remap a bunch of pins. 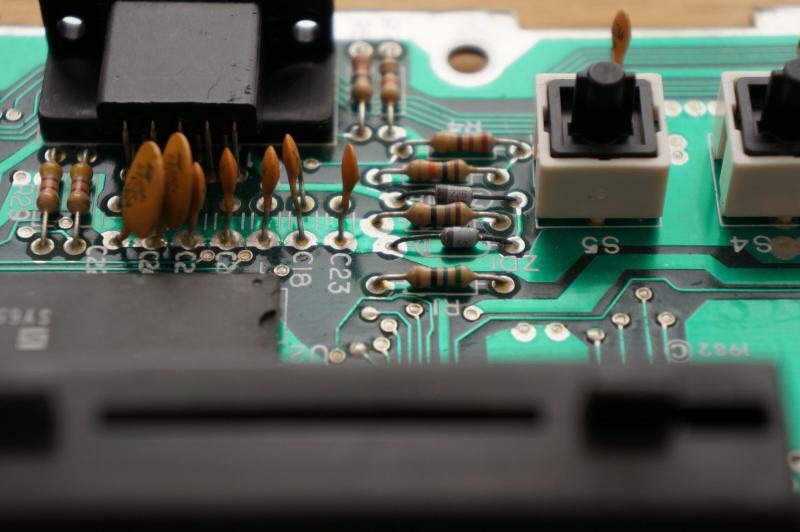 Nah - I'm going to try and take the easy route by using one of Tim Worthingtons Atari 2600 RGB mods. I'm pretty sure it should work - I just need to figure out the appropriate wiring. 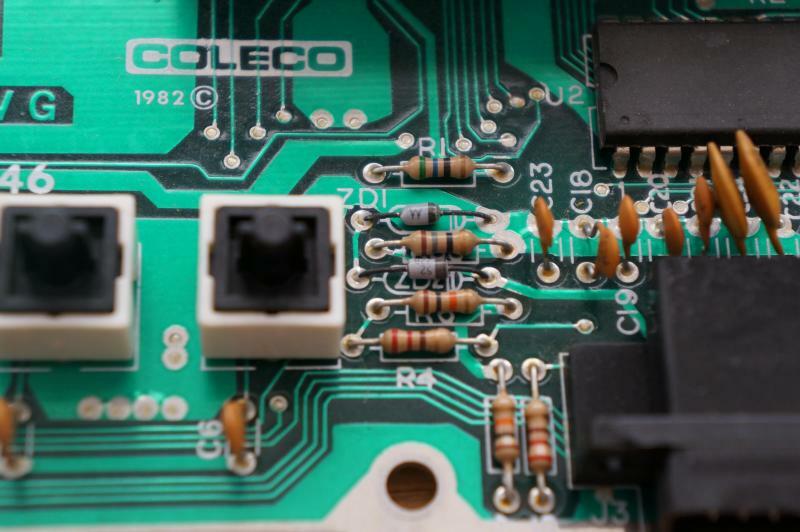 For one thing the pinout on Coleco's fake TIA is different to the Atari TIA. The sandwich board I was thinking of would remap the pins accordingly. Looks like you'd need it anyway to use his mod, since it involves plugging the TIA chip into his daughter board. With Tim's mod you don't need to plug the TIA into it, for example the 2600 Jr install uses a custom flex to connect the TIA to the mod board. I was just thinking of using wires to achieve the same thing. So here's my update, I replaced the two diodes and the resistor and get a black screen. Could this be the chips at this point? What testing equipment do you have? Ideally, a multimeter with advanced features such as a frequency counter would be a good start. Logic probe would be even better. Oscilloscope would be awesome. I have a multimeter (think it does frequency, but I'll need to check). I'm considering the logic probe since they're not that expensive. The oscilloscope is a little too high of a price for me (with my knowledge of these things). Okay. Well take voltage readings with the black probe on exposed screw hole surfaces. The red probe is for measuring pins. Get a voltage reading on the E4002 chip U3, on pins 2, 11, and 26.